Presently, the only places to see sea otters in Oregon are at the Oregon Zoo and the Oregon Coast Aquarium, where this guy lives. “For about 110 years now, there's been a big hole in our environment," said Peter Hatch, a Siletz tribal member living in Corvallis. "The sea otter has been is missing from the Oregon coast." Hatch recently joined the board of a new nonprofit dedicated to bringing the sea otter back to Oregon waters. The group is named the Elakha Alliance — "elakha" is the Clatsop-Chinookan word for sea otter. "We are very heartened by the idea that sea otters could be brought back to this part of the coast, brought back to make their range whole again and to make this place whole again,” Hatch said in an interview at a bluff overlooking the ocean in Newport. He pointed out to sea toward Otter Rock, where a hunter killed one of the last wild Oregon sea otters for its fur more than a century ago, Hatch said. At one time, a soft, luxurious sea otter robe would have been among the most valuable possessions a Siletz person could own, he mused. Hatch said other people are excited by the prospect of reintroducing the otters. Sea otters contribute to healthy kelp forests by eating sea urchins and bring balance to the nearshore ecosystem, he said. Hatch believes they would be great "ambassadors" for the Oregon coast. But excitement is not the unanimous response. 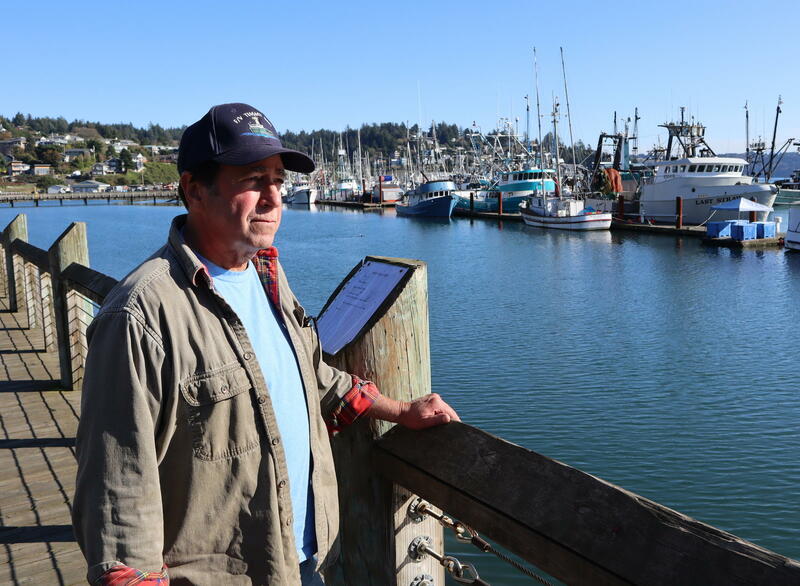 Crab fisherman Bob Eder is apprehensive about the prospect of sea otter reintroduction. "The notion of full-scale reintroduction of otters makes me feel very apprehensive because we don't know how that will affect commercial fisheries," said Newport crabber Bob Eder. Eder said he is mindful that sea otters have remarkable charisma. But they're also known for their big appetites and a diet that includes Dungeness crab. Eder's concerned that reintroduction could change his industry. "Unlike the crab fishermen, [the otters] don't take just the large mature males that have already reproduced," Eder said in an interview at the bayfront. "They take the females. They eat indiscriminately." The director of the Oregon Dungeness Crab Commission made the same points in a separate interview last week. Dungeness crab represent the single most valuable commercial fishery in Oregon. "We need to really study this because we may be displacing one mammal — fishermen — with the reintroduction of another," Eder said. Elakha Alliance Board Chair Bob Bailey predicts that 100 reintroduced otters would make a negligible difference for the overall commercial harvest. A lab at Oregon State University's marine science center in Newport is currently studying whether society and the marine environment are ready for sea otter reintroduction. Masters student Dominique Kone is examining ocean conditions. "Is there suitable habitat?" Kone asked. "Is there enough prey? Because we know sea otters are constantly eating because of their high metabolism." Kone's initial assessment is that some spots off the coast, particularly the southern Oregon coast, look pretty good. Otter Rock, offshore at upper right, is where one of the last wild Oregon sea otters was killed by a hunter more than a century ago. Kone said he would look for any lessons to be learned from the earlier reintroduction effort in Oregon. His graduate advisor, OSU professor Leigh Torres, said it is something of a mystery why the 1970s reintroduction did not succeed in Oregon as it did in Washington and California. "What's interesting about that previous, failed reintroduction effort is that otters were doing well to begin with for the first couple of years," Torres said. "They were feeding, actually having pups and doing well. Then they sort of split town and just weren't seen again." The founder and director of the new Elakha Alliance guesses it could take many years to get the green light to reintroduce sea otters along Oregon's coast. "We are very early in the game," Bailey said. "We haven't even really scoped out the 'What would it take' type of discussion, the logistics. Where would these animals come from? Where would they go? What would the impacts be?" Bailey organized a one-day symposium in Newport last month with scientists, agencies, tribal representatives and interested citizens to talk about the existing state of the science. He said the next step is to draw up a strategic plan for how the Elakha Alliance should proceed. The state Department of Fish and Wildlife and the U.S. Fish and Wildlife Service, meanwhile, are noncommittal. A USFWS spokeswoman said many public meetings lie ahead if the reintroduction idea gains momentum. Federal biologists who are monitoring the sea otters along the Washington and central California coasts say those populations are healthy, but they are not colonizing Oregon on their own. "There's more support for active reintroduction than waiting for natural dispersal," concluded Danielle Moser, wildlife program coordinator for the environmental group Oregon Wild, after attending the Elakha Alliance science symposium last month. "The sentiment was that active reintroduction is needed if we want sea otters in Oregon anytime soon." The current Washington state population of around 2,000 animals stems from 59 sea otters that were relocated to the Olympic Peninsula coast from Alaska's Aleutian Islands in 1969 and 1970. Washington's sea otters are now spread out between Point Grenville on the Quinault Reservation and Pillar Point in the Strait of Juan de Fuca. Occasionally, one or two Washington sea otters are spotted exploring Oregon waters, but those wandering animals have not stayed. This fall, the Oregon Coast Aquarium in Newport launched a capital campaign to expand its sea otter holding facilities and build a marine mammal rehabilitation center. Both of those would be useful for a sea otter reintroduction campaign, if one is eventually launched. The Oregon Coast Aquarium is currently home to three sea otters that rank among its most popular exhibits. 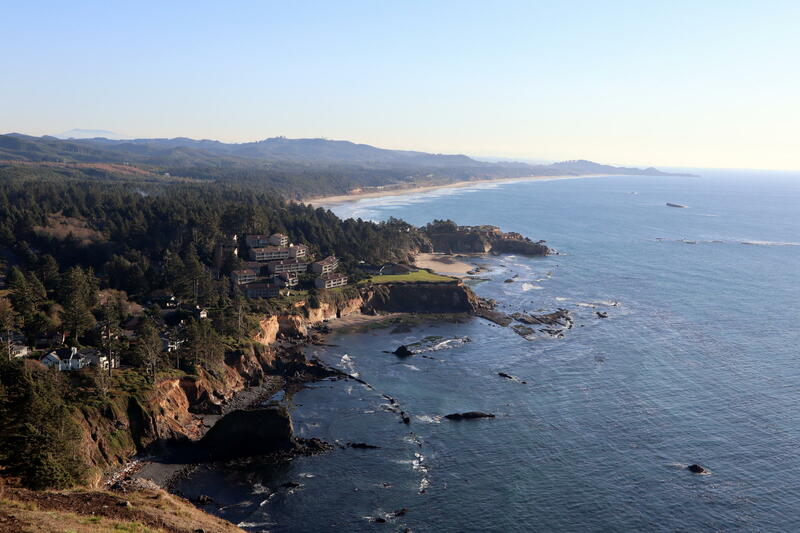 The Oregon Coast is getting a new tourist attraction. The University of Oregon is holding a ribbon cutting and grand opening Saturday in Charleston at the mouth of Coos Bay for its new Marine Life Center.